While a late spring or mid-summer wedding may be ideal, it’s almost guaranteed that prices will be higher during this time, as the majority of couples choose to marry in the warmer months between September and March. There is also risk of not being able to get your preferred date, as many venues book out quickly during this time. To save money and avoid missing out on your date, consider getting married in the off-season from May to August. Sure, the weather may be colder, but you can always pray for a sunny winter’s day! A three-course meal at your reception may be fancier, but the cost per person is much greater than serving just canapes or hors d’oeuvres. Plus, some people won’t finish their entire meal or will skip dessert, so it’s much more cost-effective to serve finger food instead of a three-course meal. If you’re worried about people getting enough to eat, consider serving a buffet – it’s cheaper, and people can eat as much or as little as they like, cutting down on wastage. Sure, covering your reception hall in bouquets of white roses may look stunningly extravagant, but there are plenty of other flowers to choose from that won’t break the budget, such as daisies or sunflowers. Save the costly flowers for the bouquet, and opt for a cheaper one to decorate the room with. Also, be sure to check which flowers will be in season when your big day arrives too, as these will likely be cheaper. If you, or a friend, know someone who is handy behind the lens, consider hiring them to do your wedding photography rather than a professional photographer. Check out their work, get some sample shots taken and decide whether it’s worth it to save a few hundred dollars. Thanks to camera technology and editing programs, it’s easier than ever for an average photographer to take above average photographs! When the day of your wedding is meant to be one of the most important days in your life, it’s hard to put a price tag on it. It’s also why couples get so carried away and end up spending way over their budget. 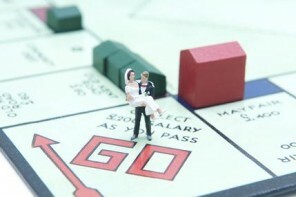 The Australian Securities and Investment Commission estimate the average cost of a wedding to be roughly $36,200. To put this in perspective you could buy 18 round the world plane tickets, or put a solid down payment on a house. The cost of your wedding will ultimately depend on what type of day you’re looking to have, but if you’re looking for ways to save, read on. It may not be traditional but when you don’t want to scrimp on your wedding venue or open bar you have to find other ways to cut costs. Trawl through your guest list and find roles for your loved ones to fill. That cousin who went to beauty school? That’s your make-up artist. Your friend who moonlights as a part-time photographer? That’s your wedding photographer. Wedding Tip – If you’re bringing two families together then get the kids to help design table centre pieces, not only will it cut costs but the outcome will be a beautiful and touching result. With sites like Pinterest you’ve got access to a wealth of wedding ideas and inspiration without using the expensive services of a wedding planner. Without completely discounting the benefits of hiring a professional, using such sites can provide ready made wedding paraphernalia for you to copy, or even modify at a reduced cost. You can also use the services of websites to print your own invitations and save-the-date notices. Your reception will have your other half, and a whole team of friends and loved ones so is the location really all that important? If the answer to that question is yes then it is worth it to spend big on the reception of your dreams, after all you’ll only get married once (hopefully!) But if it isn’t the end of the world then consider using a gorgeous public park or beach to take your guests and celebrate long and hard. Not only will these areas cost infinitely less than hiring a large space, but the back drop will make for an incredible photo op at a fraction of the price. 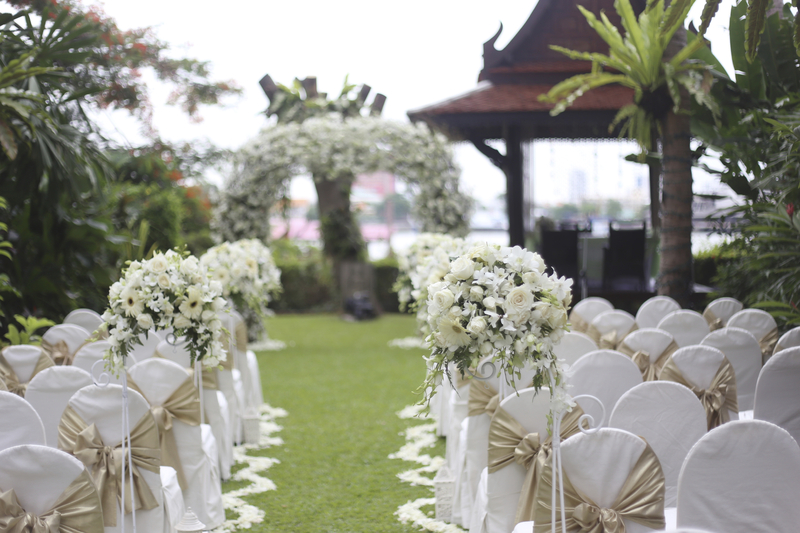 Wedding Tip – If your backyard is big enough consider moving the reception to your home. Nothing can compare with the intimate and romantic setting of your family home and a back yard full of loved ones. Below is an average cost of what you can expect to spend on your big day and how you can save. Tip: Moving the reception home or to a public place will lower this cost by thousands of dollars. Consider making your own appetizers to lower the food bill further, as many caterers charge in the thousands, you can freeze your own creations and re-heat them before your guests arrive. When it comes to the alcohol you can go all out, but try serving just one signature drink to your guests before they pay for their own beverages. If you and your partner love cocktails then serve all the men with a classy Manhattan and all the women a fresh French Martini to really make it personal, and memorable. Tip: Look up sample sales and factory outlets in the area. Depending on your style, you can find white dresses that cost $100-$500. The Zimmerman outlet for example has a range of long white dresses that would be great for bridesmaids and the bride. Tip: Download Wedpics to crowdsource your wedding pictures. Or ask a friend to bring their SLR camera. Tip: Ask your guests to recommend song choices on their RSVPs then hire a live musician to play their songs. Doing the same for your reception’s DJ means you can cut your entertainment budget to under $1000. Using a combination of in-season flowers or even silk alternatives can mean huge savings. Alternatively, purchasing a $500 wedding bouquet set then transporting it to the reception before the guests arrive means you can cut your flower and decoration costs in half. If you or any of your bridesmaids have a knack for floral arrangement, consider heading to the flower markets the day before the wedding. A good selection will only set you back about $500. 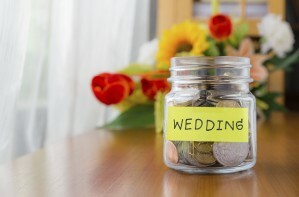 There are many ways you can splurge and save on your wedding day and budgets may not always go to plan. If your budget needs a boost, speak to one of our consultants at Easy Plan about personal loans. You’ve got the ring, now you need to plan the wedding. Wedding planning is difficult, you’re never going to make everyone happy, but the most important person you’re going to have to keep happy is reading this – you. At the end of the day it’s your wedding, so make sure you focus on what’s important to you. Everyone will have their own opinions, make your wedding your own. Filter everything into 1, 2 and 3. Calculate what the “must haves” tally up to, and see how much you have left for 2 and 3. Ideally, we would like to be able to spend obscene amounts to get everything we want. Realistically, you’ll have to sacrifice some things to make what’s really important to you comes to life. those it would be nice to have. There aren’t corners to cut with the guest list, you either invite some people or don’t invite others. The guest list will have a big effect on the rest of the budget, as the venue and catering budget will make up around half of your entire wedding budget, depending on how big you go. Splurge – invite everyone. You can’t have enough. Steal – invite immediate family and your most intimate friends. Spend your special day with those truly special to you. Unless you’ve been planning the big day for years, there are people that can help. There are things you can miss, there is help finding the most tasteful option to fit your budget – there is lots a professional knows and has dealt with many times before that can save you a giant headache. Splurge – get a professional wedding planner with a portfolio of amazing weddings. Steal – crowdsource ideas from your friends that have already gone through planning their own weddings. Find what’s important to you and stick to it. Compromise on things that aren’t a priority. Flowers aren’t a big thing for some couples – some choose to forego everything but the bare necessities of the bouquets, whereas others love flowers, and need them there to complement the theme of the wedding, depending on the venue. Music and dancefloors. Again, if dancing is something big for you and your family and friends, you need a dancefloor to accommodate a large amount of people. Coupled with that is a good DJ/MC, as they’ll be controlling the pace of the evening for you, helping the photographer and generally helping to keep the music flowing along the lines that is keeping your guests happy. Splurge – A live band, flowers to rival Floriade, a photobooth and all the bells and whistles you can cram in. Steal – focus on one really important point and take bottom dollar for the rest. At the end of the day, if you try to get everything, looking at your budget can give you nightmares. Focus on what’s important to you, and stick to your budget. You may need finances or a loan to get what you want perfect. It’s your day, make it count.